Aw nerds! Looks like this page may be out of date. Please visit NerdWallet’s Best Credit Cards For Bad Credit page for updated info. 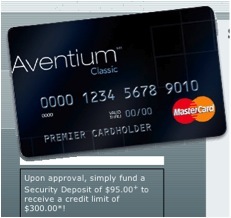 Fortunately, there are cheaper and more straightforward alternatives to the Centennial and Aventium for those with less-than-stellar credit. The Orchard Bank MasterCard is intended to help establish or reestablish credit. HSBC, which owns Orchard Bank, gave the bank the goal of helping those with the least access to credit. While it does have some fees, it is far cheaper than First Premier’s cards and offers much lower interest rates. The interest rate falls between 14.9% and 19.9%, and the annual fee is $68 the first year and $59 after that. The Orchard Bank MasterCard is among the easiest unsecured credit cards to qualify for: FICO scores as low as 500-600 have made the cut. Among the few hard-and-fast qualifications are a $12,000 salary and a valid social security number. If Orchard Bank credit cards are not an option, a secured credit card is open to almost anyone and can help to rehabilitate credit scores. Orchard Bank also offers a secured MasterCard with an APR of 7.9% and an annual fee of $35 that’s waived the first year. The Applied Bank Platinum Zero has no interest rate, but has a high $119 annual fee and requires a deposit of $500 or more. Many credit unions offer low APRs as well as low fees. And amongst larger banks, the Capital One Secured Card and the Citibank Secured Card come with a high APR of 22.9% and 18.24% respectively (as of this writing), but have unusually low annual fees of $29. Secured credit cards require an up-front deposit, usually equal to the credit limit. This deposit will not be used to pay down a balance; it’s collateral held against default, and is returned when the account is closed.